Now that GOALSeattle soccer news has moved over to Seattle Soccer Examiner, you may want to update your links and connections. Here is our Twitter Feed: www.Twitter.com/goalseattle. It now lists news as it is posted on the Examiner page. This blog is going on hiatus! What? No-o-o-o-o-o! However, the same content and full focus on ALL OF PUGET SOUND SOCCER will now be updated daily at the new source, my Seattle Soccer Examiner page! Please change your bookmarks. This page will remain dormant but online for links, referrals, etc. You can also get to the Seattle Soccer Examiner the same way you used to get to the GS blog: by clicking 'blog' on the front page of GOALSeattle.com. Please do follow me over there! www.Examiner.com/Seattle offers me a chance to reach more fans, make a bit of cash, and for you a chance to keep getting insider news and updates about the Sounders, Wolves, Pumas, Tide, Redhawks, Huskies, Falcons, Sounders Women and Synergy. See you over at the "X." It's too cold out for shirts and shorts but that didn't stop Seattle Sounders FC from training at Qwest Field on Monday. The club are back from Argentina and there are only 10 days left before the home opener against New York. (The Sounders practiced) with many new faces on the pitch and several seeing the team for the first time in over two weeks. The most notable player to don the Sounders FC kit for the first time in training camp was midfielder Freddie Ljungberg, who joined the team for the first time after hip surgery in December. While he spent the majority of the training session doing fitness work along the end lines, his presence was a welcome addition to the Seattle lineup. Though limited to non-contact work, it was imposed by the team and not by Ljungberg’s limitations. Wear your Sounders scarf on Fridays! 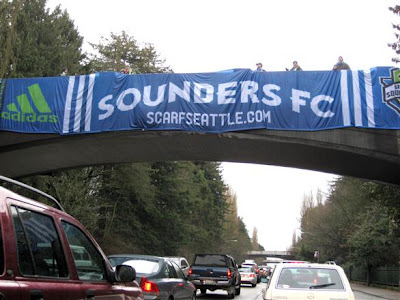 Every Friday from now until...um, you drop...wear your Sounders scarf to show you support Seattle! OK, you can wear it more often than that, but especially every Friday to work, on the bus, where ever. This idea is sponsored and endorsed by the Emerald City Supporters, GoSounders.com, Prost Amerika Soccer, Sounder at Heart and the Sounders Fan Insider! Other news today: Qwest Field will host a 2009 Gold Cup match on July 4th, and it looks like USA may be one of the clubs in town! Sounders FC have bid to host their play-in match in the US Open Cup in April...and won! So the Sounders will host Real Salt Lake at Starfire. Details here. 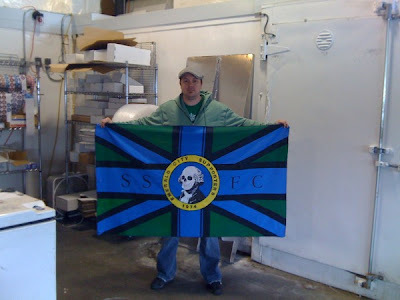 When Saarhiem was contacted as the winner, he took the GOALSeattle Sounders FC Flag contest for a new spin. "I started this project a month ago and and could not be happier with the results. But with that said, I think it would be best to give the season ticket to the guy who made the Chief Sealth flag (Joe Olson). You see I have two season tickets in the south end already and what I can gather from various message boards he has none. It would be a shame to know that flag #3 is sitting in a living room on game day and not flying proudly in section 122. 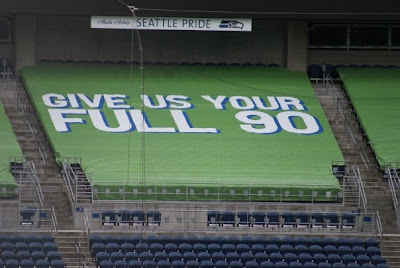 I would trade down to the jersey knowing that one more die hard SSFC fan was able to stand, sing, and support our Sounders, that would be enough of a prize to me." 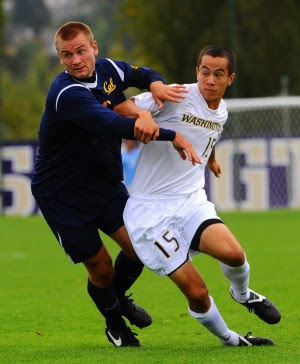 Read the entire story over on our Seattle Soccer Examiner page! Fox Soccer Channel debuted its half-hour Major League Soccer 2009 season preview on Sunday night. The next airing will be Monday March 9 at 5:00 PM Seattle time. Speaking of previews, Laurie at the Seattle Offside blog is starting a series of "Get to know your Sounders" quiz blogs. Check the first one out here! Of course the league will be without gate-enhancer David Beckham until August. Several of us think he's a jerk. Prost America Soccer weighs in; Seattle Soccer Examiner slaps Becksy around. Next Season Sports continues its profiling of Sounders FC players. This time out it is a look at speedy midfielder Sanna Nyassi. A change of 'Heart?' No, not Beckham. Dave Clark, who also gives a sneak snip of the new fan magazine "Soccer Seattle." It will be good despite the name. The Kitsap Pumas professional soccer club is in for a big, busy spring. The club is preparing for their first-ever league match May 2nd in Spokane against the Spokane Spiders. 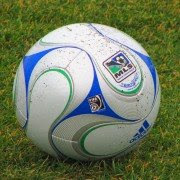 It will inaugurate their debut season in the Premier Development League (PDL) of the United Soccer Leagues (USL). The Pumas have yet to announce any player signings, but rumblings are growing that soon we'll have some names to report on. The Pumas are developing a connection with scouts and contacts in Great Britain. We've been told that as many as twelve player contracts may have already been issued, and that at least one local player has signed. Some of the contracts are out for players from the UK. The Pumas are high on a 20-year old Scottish midfielder who trained in the Rangers system. They also have their eye on a sturdy 21-year old English goalkeeper who went through the Wigan Athletic system. We've also heard that Kitsap have talked with a 21-year old English 'beach soccer' star. The names await the club announcement(s). Last week Pumas' owner Robin Waite attended a Bremerton School District meeting in which he talked about his ideas for building a soccer stadium on land where East Bremerton High School once stood. The BSD gave Waite permission to study the idea more closely. "I think what's intriguing about it is that it's a very valuable piece of property and we don't make a penny from it," board member Pat Jones told the Kitsap Sun. Waite's idea "is definitely worth exploring, especially for free." 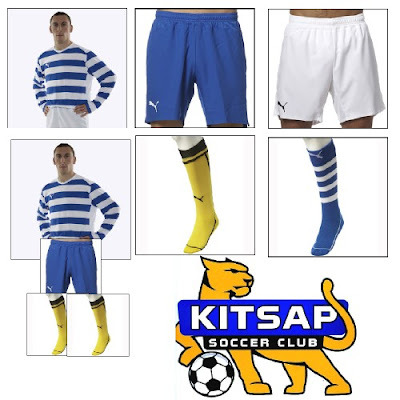 Kitsap will be revealing their chosen 'club crest' in the next few weeks, too. Fans were invited to submit crest / logo ideas to the club website in a recent contest. (See a few submitted designs here). The 'crest' is an important part of club tradition in the world of soccer. It becomes the 'coat of arms' clubs go to battle with. The Pumas' crest will use the official club colors of blue, gold, black and white. The Pumas have already chosen their 2009 uniform provider and style. The 'kits' will be made by Puma, of course, and the shirt will be white with blue hoops. The graphic above gives a representation with possible combinations. SEATTLE - (courtesy of GoHuskies.com) Washington men's soccer kicked off its 2009 spring season this week, an exhibition slate that is highlighted by two home matches at Husky Soccer Field and a tilt with Seattle Sounders FC at the Starfire Sports Complex in Tukwila on April 21. Washington will then play the bulk of its schedule in April, starting with a trip to Portland to face the rival Pilots on Saturday, April 4, at 2 p.m. at Merlo Field. UW will return to Montlake to host Seattle University at Husky Soccer Field on Friday, April 10, at 6 p.m.
UW will battle Seattle's new Major League Soccer side on Tuesday, April 21 at the Starfire Sports Complex. The match will start at 10 a.m. The Huskies will wrap their spring schedule traveling to Spokane to face Gonzaga on Saturday, April 25 at 2 p.m., before facing Seattle Pacific at Interbay Stadium on Friday, May 1, at 7 p.m.
Washington is coming off a 2008 season during which it posted an 8-8-2 overall record and finished in a tie for fourth in the Pac-10 standings with a 3-5-2 league record. 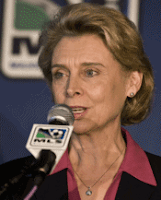 Washington Governor Gregoire: "I have Sounders FC season tickets"
Prost Amerika Soccer talks with Washington State Governer Chris Gregoire in an interview published this week. Gregoire is a fan of soccer. "By bringing the world’s most watched sport here, we are putting Seattle and Washington in the spotlight for the world to see what we all already know. The great state of Washington offers an array of unique attractions and natural beauty. Our hope is that those who come from out of town to see a MLS game will return over and over again, and spend money here to stimulate the economy. My husband, Mike and I have season tickets." Read the entire interview, covering a range of topics, here. 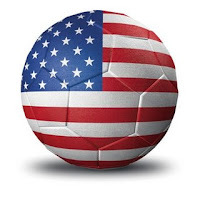 The build up to kick off 2009 continues and so does the tidal wave of soccer news. 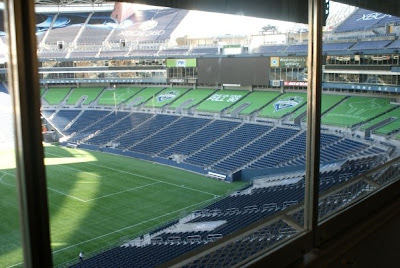 Over on our Seattle Soccer Examiner Page we've got details on Seattle's soon-to-be official awarding to host Major League Soccer's Final at Qwest this November. 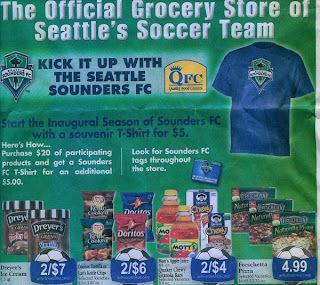 In the GOALSeattle Forums we've posted an ad from grocery chain QFC. They will be the 'official grocer' of the Sounders, and they've got a $5 t-shirt deal and Sounders player appearances going on. The QFC ad starts WEDNESDAY MARCH 11th. Want to know how much the Sounders players make? See here. Dave Clark from Sounder at Heart looks at the numbers. A poll on MLS-Daily.com has some good results for Sounders fans. Prost Amerika has the scoop. GoSounders.com has the news of the Sounders' Spanish-language radio broadcasts. 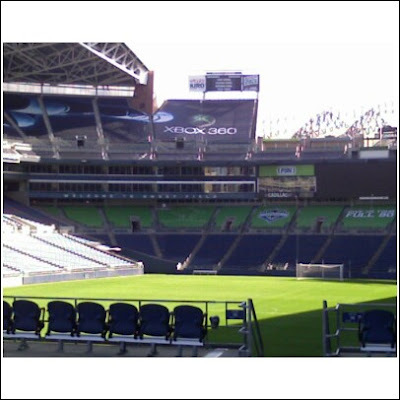 Greg Roth was inside Qwest Field Friday and through the Sounders Fan Insider's eyes and lens we get a sneak peek at "Xbox Pitch at Qwest Field." See ten photos at Seattle Soccer Examiner. Sounders FC have arrived...back in Seattle after a trip to train in Argentina. A smattering of fans were on hand at SeaTac Airport to greet the players, who will now spend the next 12 days getting ready for the home opener at Qwest Field March 19 against New York. A fan got his season tickets today! 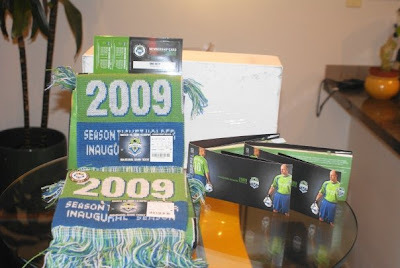 Lucky for us he also posted in the GOALSeattle forums with several photos of the blessed package! Be sure to login to the forums and give a shout when you get yours! See the thread and more photos here! See Gregro's Facebook photos! Time to VOTE in the flag contest! 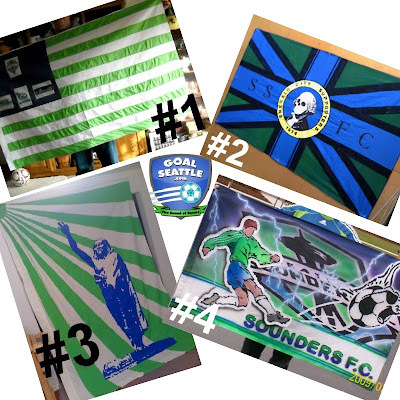 The GOALSeattle flag contest is entering its final weekend as the four finalists are now done and their flags are being put up to a public vote on the GS forums! The winning flag / maker gets a full 2009 south end season ticket! The Sounders have added to the prize winnings, too! The club will give a jersey to the second-place winner and a signed Kasey Keller soccer ball to the third place finisher! Two judges will decide the winner. If they can't agree then the public vote will break the tie. Register in the forums here and then go to the voting thread and cast your vote by Sunday March 8th! I am not sure what to say about this video. What do you think? Like they always say..."You've got a face for radio!" Watch for the middle finger and a Sounders FC scarf coming out of a guy's fly. Hey, it's a Seattle 'rock' station. It has been a crazy day in the Emerald City with the Wexley 'viral' add campaign doing just what it is supposed to do. 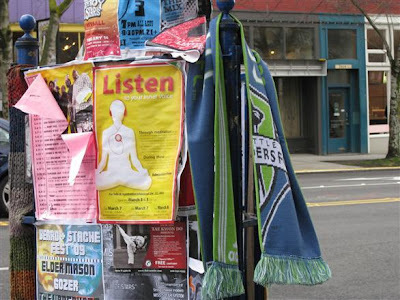 We've got more on the scarves that ate Seattle here. We've got scoop today about some of the match day activities the club are planning for fans. There is a bit of actual soccer news today, too. Fans in the GS forums reported it first: Jarrod Smith has been put on the injured list by Seattle. Jarrod who? NextSeasonSports.com has a look at how Qwest could become the Sounders' 12th Man. Fans are talking about the 'viral marketing effort' in the GS forums. The Sounders lost 1-0 to River Plate today in Argentina. Quick! Get on that plane. Speaking of planes, if this is your bag, the club are encouraging fans to meet the Sounders at the airport tomorrow. 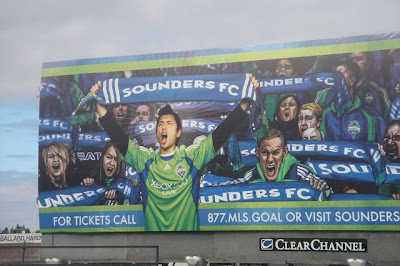 Did you miss the behind the scenes blog about the Wexley Sounders billboards? Check it out here. Hmm...one of those ardent scarf-wavers sure looks a lot like...me! ESPN / Ives posts a season preview of the Sounders here. 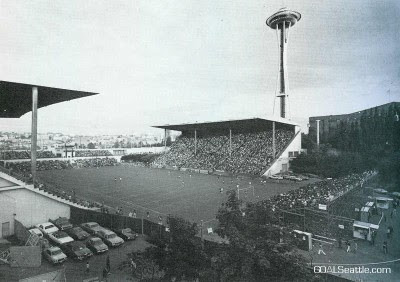 Visit GOALSeattle.com's extensive soccer museum for much more on all three 'versions' of the Sounders. Professional soccer is on the rise in Seattle with the imminent debut of Sounders FC in Major League Soccer. 32,400 fans will pack the lower bowl of Qwest Field on March 19 as Seattle hosts New York Red Bulls in the city's first-ever MLS match. The club have capped season ticket sales at 22,000. For those of us who have passionately followed all three incarnations of the "Sounders," March 19 will feel like a brand new beginning with serious deja vu undercurrents. Seattle, the 'sleeping giant' of soccer in the Northwest, has reawakened. Here's a look back at Sounders attendances in which we'll also be visiting with some local soccer writers and Sounders fans who are following the new club with their own internet presences. Read the entire article at my Seattle Soccer Examiner Page! Go behind the scenes of the United States - Mexico soccer rivalry in this video feature leading up to and including the night of February 11, 2009 when the two faced off in Columbus Ohio in a World Cup qualifying match. 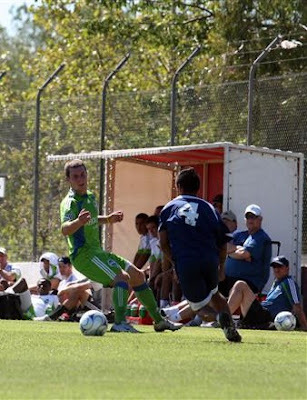 Erupting for three goals within a 10-minute span, the Seattle Sounders FC extended its preseason unbeaten string to five matches with a 5-0 defeat of Tristán Suárez in La Plata, Argentina, on Tuesday. Corner kicks set-up the final two Sounders FC goals. In the 43rd minute a Le Toux corner was weakly punched by the Tristán Suárez keeper. Patrick Ianni headed it back into Scott, whose header found the net from a sharp angle to the left. Le Toux flashed near post to nod home Montero’s corner from short range shortly before the final whistle. It was the first goal of the preseason for Le Toux. None of the three Seattle keepers was seriously tested by the Tristán Suárez attack. Notes: Although Tristan Suarez is based in Buenos Aires, where Sounders FC is staying, the game was played an hour away due to the lack of available fields…After Monday’s game was canceled, the only available practice site was an artificial turf surface in downtown Buenos Aires…Evan Bush made his debut in goal, playing the final 30 minutes, but he was not required to make a save. ..A total of 11 players played 60 minutes. I literally can't seem to step away from my GOALSeattle blog chair today without coming back to more Sounders FC news! Greg Roth has a collection of great photos of what the Qwest Field tarps are looking like, on Facebook. Alaska Airlines Magazine has featured a photo from GOALSeattle photographer Rick Morrison in their March 2009 in-flight magazine. Rick was kind enough to scan it for us, and you can see the entire spread here. Jack Bell may have called Joe Roth "Joe Smith," but other than that his feature today on the Sounders and Sebastien Le Toux is good reading. Not much to report on 'roster compliance' day, except that the Sounders are...compliant. Next Season Sports is doing a very nice job of previewing the Sounders. 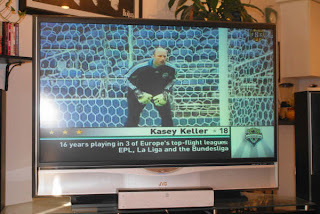 The latest is a look at the Seattle defense and Kasey Keller. RENTON, Wash. – (Club press release) Single game tickets for the Seattle Sounders FC inaugural home opener on March 19 sold out this morning. Sounders FC will kick off the 2009 Major League Soccer season at Qwest Field versus the New York Red Bulls with more fans than originally planned. Due to the anticipation and tremendous enthusiasm from soccer fans, the seating configuration for the March 19 home opener has been expanded to 32,400. Sounders FC will also cap season tickets at 22,000. The team recently surpassed 20,000 season tickets, the largest season ticket base in Major League Soccer. The seating configuration for regular season matches will be increased to 27,700 seats, making it one of the larger venues in Major League Soccer. Season tickets will be capped to accommodate group, partial season and single game ticket sales. Season tickets consist of 18 home matches, including the March 19 home opener and July 18 match versus English Premier League power, Chelsea FC. Single game tickets for all other home matches are available at www.SoundersFC.com or by calling 877-MLS-GOAL. Individual match tickets for all 2009 Sounders FC MLS home dates go on sale today at 10:00 AM via Ticketmaster and the club website. By the end of the day several matches are expected to sell out. Act now or watch from your couch this summer. The Monday training match between the Sounders and Velez Sarsfield has been cancelled due to heavy rain. SoundersFC.com has details. Soccer America gets our attention this morning with this headline: Sounders Mania - Back to the Northwest. The MLS Soccer Examiner predicts Sounders FC will be a playoff club. I am quoted at the end of the article, though I haven't officially made my own predictions yet. MLS Seattle: The Beautiful Game in the Emerald City has two posts you need to read. The first is a comparison of last year's expansion San Jose Earthquakes with this year's Sounders. The second is the first in a series of previews of the other clubs in MLS, starting with the 2009 LA Galaxy. My Examiner.com feature, wondering aloud about what Seattle's ticket holders will bring to the efforts to establish Qwest Field as a 'intimate soccer venue,' is a big hit. Thanks for all the reads. Miss it? You can read it here. WeAreECS.com's forums recently featured the photo in this post. The billboard is near Ballard. Watch for other such works of art in the coming weeks. Emerald City Supporters posed for photos for the club adverts. GoSounders.com brings to our attention that Steven Goff of the Washington Post still insists Seattle have the inside track on hosting MLS Cup 2009.